Pentacon Dresden was perhaps the most renowned East German 35mm film camera and lenses manufacturer. Traditionally Jena, Dresden or Leipzig were all important names in the optical industry in Germany. In the first 20 years of their existence, Pentacon only produced cameras which had Zeiss, Meyer and Schneider lenses. 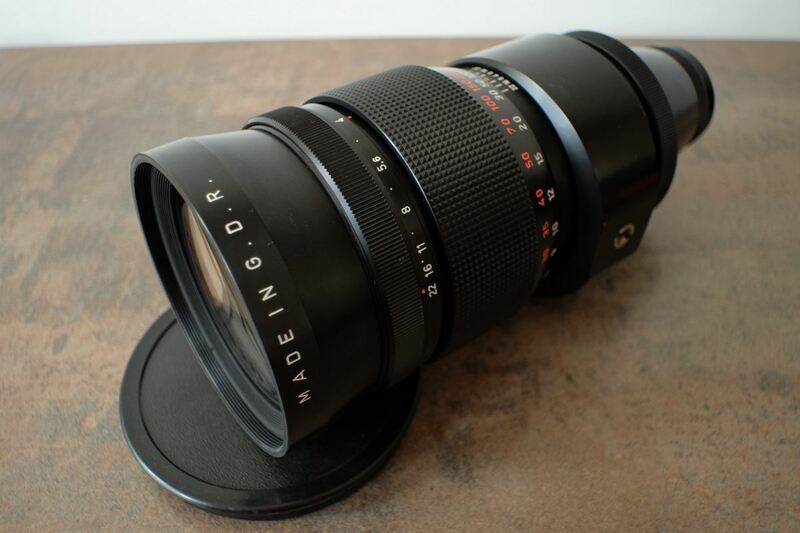 Only after Pentacon merged with Meyer-Optik in 1968, the firm was able to use its own lenses. However, in the beginning these lenses were in fact re-branded Meyers. 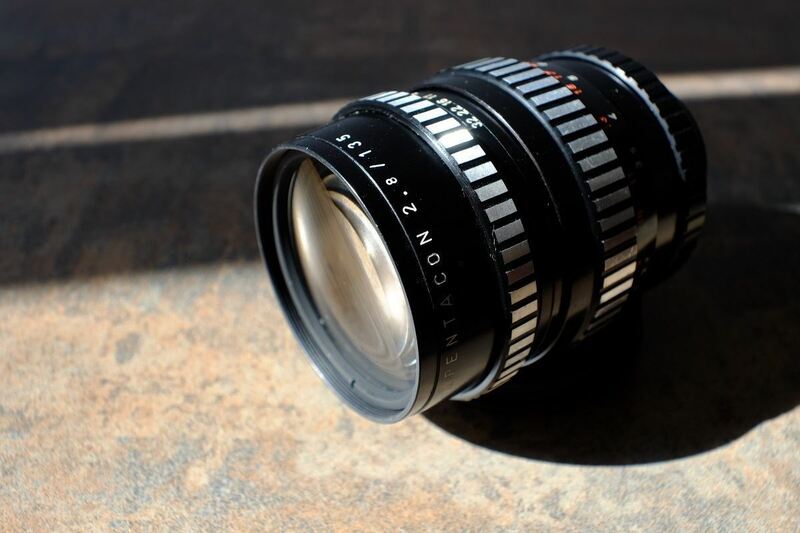 The 29mm f2.8 Orestegon became the 29mm f2.8 Pentacon, the 50mm f1.8 Oreston became a 50mm f1.8 Pentacon and so on. Pentacon mainly focused on lenses such as the 29mm, 30mm, 50mm, 100mm, 135mm, 200mm, 300mm and 500mm and apparently, not all Meyer series were continued by Pentacon. During the 1970s and 1980s the Praktica cameras were sold in kits consisting of a 29mm wide-angle lens, a 50mm standard lens and a 135mm telephoto lens, all under the Pentacon brand. The two products, the cameras and the lenses, became almost synonymous. Both products were very popular in Eastern Europe and quite well known in the West because they where reliable, budget oriented and good quality lenses and cameras. Pentacon lenses are still appreciated today, some models more than others. Mechanically, they have a relatively simple construction and their build quality is good, so they are sturdy and have a good mechanical feeling when used. Optically their performance varies: it is said that the first, "more Meyer-Optik" models are better than the later Pentacon models in some respects. 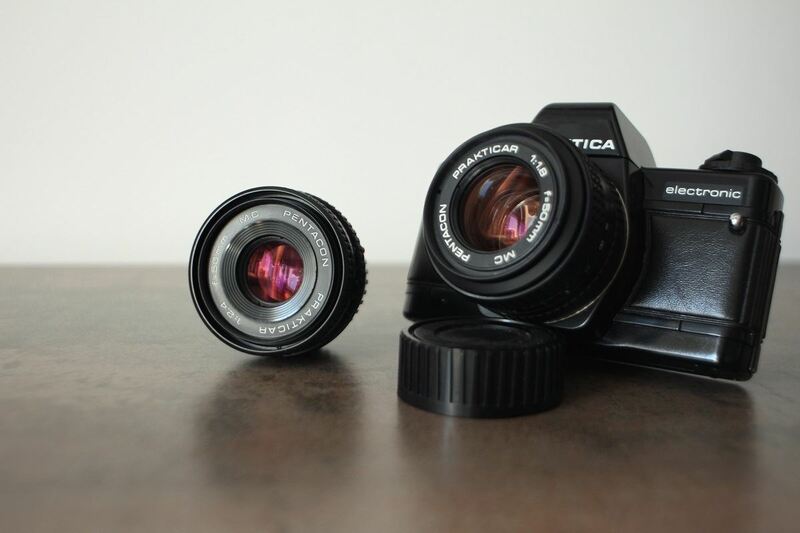 Both Pentacon and Praktica feel interesting due to their simplicity and lack of "sophistication". Also, these lenses have personality and we especially like the 15 blades 135mm Pentacon, the 50mm Pentacon and the impressive of them all, the 300mm Pentacon. Pentacon lenses are relatively easy to find – particularly the 50mm f1.8 and the 29mm f2.8 - because they were built in very large numbers. Others, such as the 15 blades 135mm and the 300mm are more difficult to come by, as aficionados generally keep to them. Differently put, as one obscure photographer from the East once said: “if you know what to look for, you won't be disappointed by your Pentacon lenses”. Yes, we find that to be pretty accurate. The Pentacon 29mm f2.8 auto multicoating is a fine wide-angle lens. Back in the days, the 29mm and 50mm together with the 135mm Pentacon and the Praktica camera were sold as a kit. The Pentacon 29mm f2.8 is a good all round performer: decent colors, sharpness and bokeh. It weighs around 200g, uses a 55mm filter and has a very good 0,25cm minimum focusing distance. Number of blades: 6. The Pentacon 50mm f1.8 auto multicoating is a classic in its own terms, being used as a standard lens on the German built Praktica cameras for quite a long time. This lens was originally designed and built by Meyer-Optik at Gorlitz. However, when Meyer-Optik merged with the VEB Pentacon from Dresden, all the original Meyer lenses were renamed. In fact they all lost their original names (Orestegon, Oreston, etc. ), for the simpler Pentacon, followed by the focal length. The Pentacon was the first of the series. It is a singlecoated, fully metal built lens with decent quality and optics. It was followed by the multi coated version, which has a different body style and is better in terms of chromatic aberration. Relatively cheap, not too sharp and available in large numbers, the Pentacon 50mm is still interesting because it has personality and if you know what to expect from this lens, you won't be disappointed. 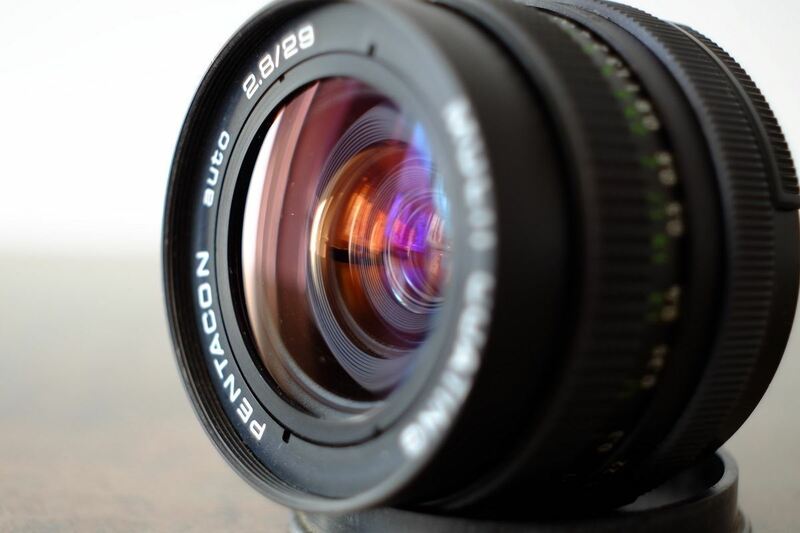 The Pentacon weighs around 215g, uses a 49mm filter and has a very good minimum focusing distance of just 0.33cm. Number of blades: 6. The MC version has the same specifications but it's lighter at 194g. 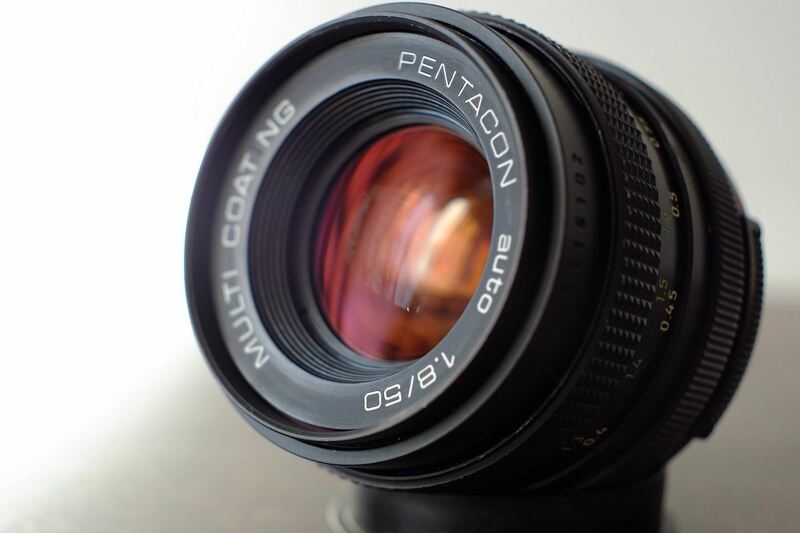 The Pentacon 135mm f2.8 auto multicoating is the last generation of the Pentacon 135mm series. It is a well built multicoating lens and a good all rounder, with generally good sharpness and with pleasant colors. It may not be as special as its 15 blades older brother, but it is also cheaper to buy and easier to find. It has a minimum focusing distance of 1.7m, it weighs 468g and uses a 55mm filter. Number of blades: 6. The Pentacon Zebra 135mm f2.8 (15 blades) is more of a collector's item, primarily valued for its outstanding bokeh. It is better built than its 135mm MC six blades sibling, having smoother focus and a better minimum focusing distance (1.5m vs 1.7m for the MC version). This version is a rebranded Meyer Optik Orestor, a singlecoated lens which has rich and friendly colors. 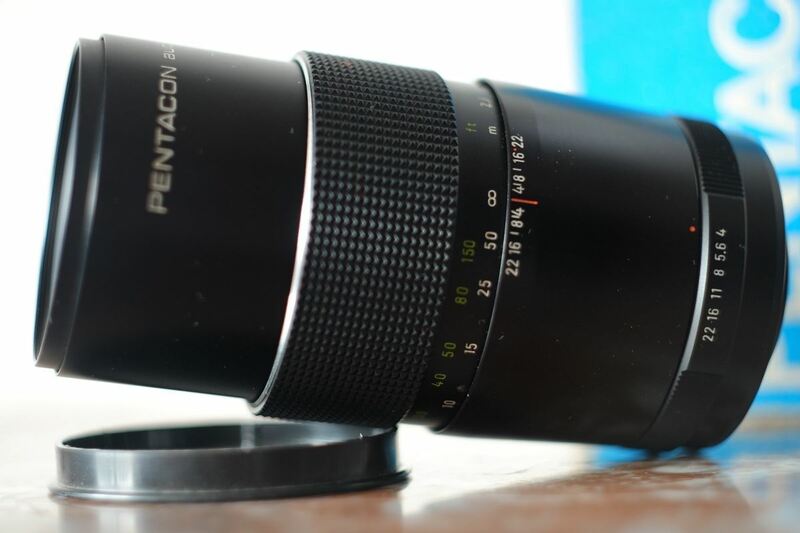 The Pentacon 200mm f4 auto multicoating is a medium telephoto lens designed and built in East-Germany. This is probably the last of the originals from the Meyer-Optik Görlitz era. 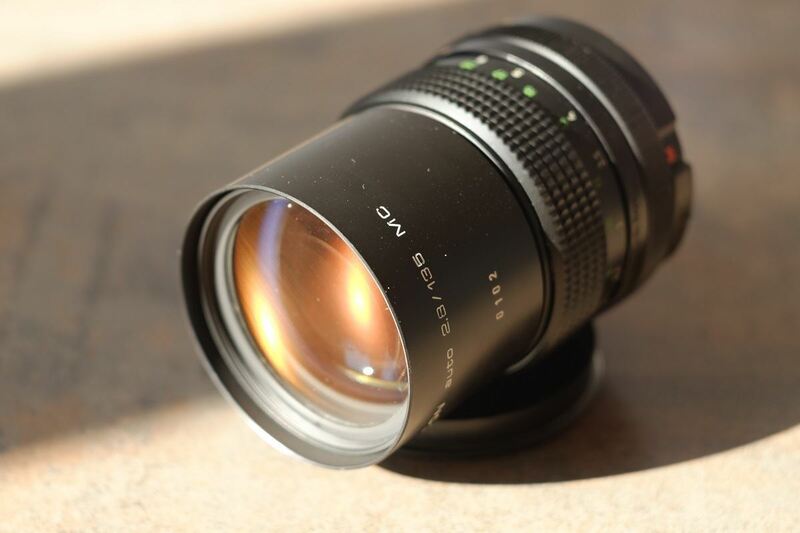 In terms of exterior design, this lens follows the same lines as the 50mm and the 135mm Pentacon. The build quality is good, the lens has a integrated sun cap and the multicoating layers has the same red-violet color. It has a minimum focusing distance of 2.7m, weighs about 1kg and uses a 58mm filter. The Pentacon 300mm f4 is another very interesting lens. Solidly built, it has good grip and surprisingly smooth focus for such a big lens. In fact, using a tripod is the only option here, so the setup must be prepared a little in advance. Once mounted, its fine optics and good aperture will make it a sensible choice when filming and photographing the sky, landscapes or architectural details. The lens on the left is the Pentacon Prakticar 50mm f2.4 (pancake) and the one mounted on the camera is the Pentacon Prakticar 50mm f1.8. The mount was changed in order to fit the Praktica electronic series. Note that the shorter version is also slower because of its smaller dimensions, having only f2.4 maximum aperture.